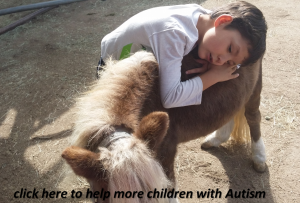 Today, thanks to an amazing miniature pony named Tori, Ezra speaks and continues to find his voice. He can even be heard singing some days, at his family’s home or in the public school where he has successfully enrolled. His outstanding progress is due to weekly animal assisted therapy sessions made possible by 1FUR1 Foundation – a nonprofit started and headquartered in Illinois, now with a chapter in Southern California. 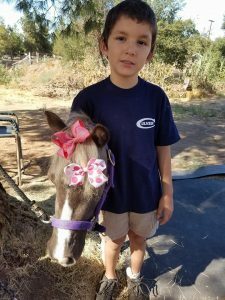 With a mission to “Help Animals Heal People,” 1FUR1 sponsored 85 animal-assisted therapy sessions for Ezra between December 2015 and January 2017. Ezra spends time learning from her, sometimes feeding her treats like apples and carrots, putting bows in her mane and grooming her. In the process, he has increased his confidence and gained neuromotor abilities his family didn’t know were possible. Ezra’s story is just one heartwarming example of the work 1FUR1 and its partners are doing. Each month, 226 Lives are impacted by 1 FUR 1’s animal-assisted service programs at 42 facilities across three states. This nonprofit is dedicated to providing free-of-charge animal assisted services to the people who need them most. Want to help more children like Ezra overcome their challenges and accomplish their dreams? Let’s do it together. Please consider a tax-deductible gift today to support our animal-assisted therapy grantees. Share this story so others can learn about the important work 1FUR1 is doing to help animals heal people.